I'm very happy to have a good paying job and to have remained gainfully employed for the past 14 years. I previously told my own personal financial story in a 4 part series. 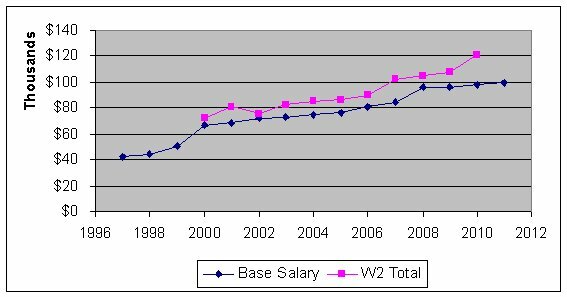 In part 4 of that I shared how my salary started at around $42,000 a year in 1997 and then grew to over $100,000 by 2009. 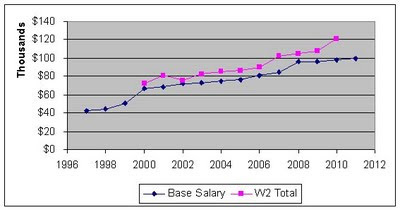 My W2 earnings are a bit more than my salary due to profit sharing bonuses and stock benefits that I also get from my employer. Those extra benefits are above my normal base salary. The salary is fixed but the bonuses vary based on how well the company does. The promotions made a huge difference in the growth of my pay over the years. If you remove those big raises and replace them with a more standard raise level of 3% then my pay would be about 2/3 of what it is today. Similarly if my pay had only grown with the rate of inflation then the $42,700 I made in 1997 would be equivalent to making about $59,800 today. My pay has grown about twice as fast as the rate of inflation. Most states have some form of lottery. I occasionally enjoy playing the lottery as a form of entertainment. $1 is not a large price to pay for a little day dreaming about what I would do with my giant jackpot which I fully realize I have virtually no realistic chance of winning. Lotteries are often criticized as being a rip off for the player. 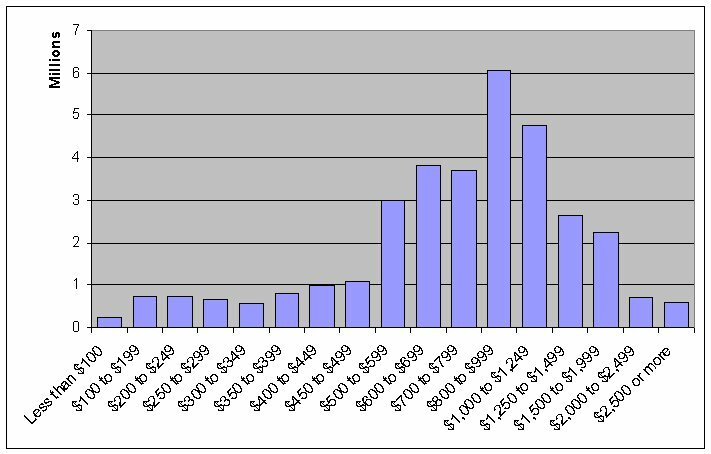 I got data on the lottery payouts and state revenue for 2006 from the National Conference of State Legislature website. Its a few years old but I doubt the numbers have changed radically. Nationally the average payout in prizes is 64.5% of the bets made. That means for every $1 spent on lottery games the players get back 64.5¢. Administration costs about 4¢ of every dollar. These are the costs spent to advertise the programs, make and sell tickets and pay lottery staff employees, etc. The remaining money left over after the prizes and administration is paid comes out to 31.5¢ of every dollar gambled. This money is kept by the state to use for roads and schools and such. Here is a table with the % of funds that are paid out in prizes, used for administration and retained in profits by the state. The life expectancy in the USA is 77.9 years according to CDC data from 2007. It would seem logical to plan for a life that lasts about 78 years give or take. If the average person lives to be 78 then it seems this is about how long you ought to figure you'll live. However people who are 65 actually live longer on average. This is generally because the older you get you've lived through the various potential risks of injury and illness that claim other lives earlier. If you look at the CDC data for life expectancy at age 65 then you'll find that people who have lived that long tend to live another 18.6 years on average to the age of 83.6. When you are planning retirement that basically starts at age 65. Retirement assumes you'll live to retirement age. Once you've made it that far, you should figure your retirement planning based on the life expectancy for someone at age 65 because that is how old you'll be. For this reason if you're figuring your retirement you should plan on living well into your 80's. Given that the average life expectancy is exceeded by a good percentage of people it makes even better sense to plan for a longer life than average in order to give yourself some margin. Because life expectancy at age 65 is in the mid 80's and because many people live longer than average, I think it makes good sense to plan to live to age 90 when you're figuring your retirement planning. Married couples should plan for one spouse to live longer. According to this article form Wachovia : "While a 60-year old man today has a 20 percent probability of reaching 95 and a 60-year-old woman a 30 percent chance, there is a 40 percent chance that at least one member of a married couple at the same age will live until 95." That means that there is a pretty good chance that you'll need your retirement money to last 30 or more years if you're a married couple that plans to retire at age 65. Of course averages are just averages. You may live longer or not. To be safe though you really do need to plan for a longer lifetime. If you made the mistake of thinking that average life expectancy of 77 means you only need 12 years worth of money at age 65 then you could drastically short change your retirement savings. To ensure a more financially secure retirement you really need to plan as if you expect to live to age 95 or longer. In a recent edition of Money magazine they have a article on health and weight loss titled Slim Your Body,, Not Your Wallet. In the article they had a side graphic showing the average medical spending of people based on different BMI or Body Mass Index values. 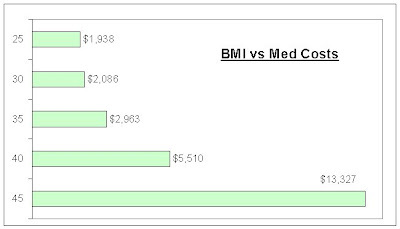 I wanted to point this out since as you can see the medical costs escalate as the BMI goes up. Theres not really much difference from BMI 25 to BMI 30, its not even 10% more. 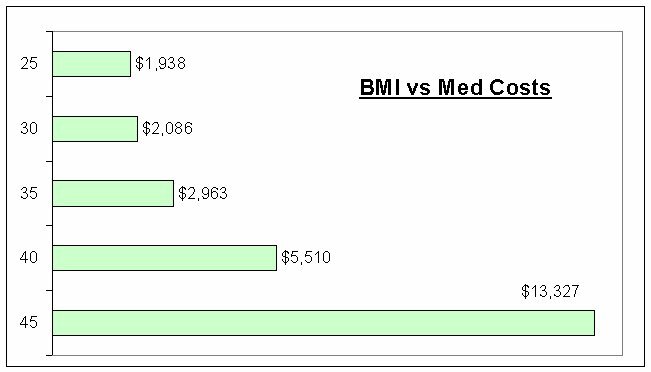 From BMI 30 to BMI 35 though it goes up 42%, then from BMI 35 to BMI 40 the increase is 86% and from BMI 40 to BMI 45 the costs escalate 142%. You may think that the cost is not a big concern to your wallet since you have health insurance. However you'll likely foot some if not all of that bill. Most people have deductibles, copay or co-insurance costs that mean they end up paying a good portion of their health care costs. You also may be made to pay extra by your employer. The article also says that currently in 2011 there are 7% of employers who charge extra for medical insurance for people with health issues like high BMI. They say that by 2012 it is projected that 33% of employers will charge extra. BMI of 25 is the threshold for 'over weight' and BMI of 30 or more is considered obese. The wikipedia page on Obesity has different definitions of the higher BMI levels. You can use the BMI calculator to find your BMI. A note about BMI: I don't believe that BMI alone is a perfect measure of your weight. BMI is a reasonable measure of over weight for most people but there are exceptions. You should also get a measurement of body fat or best yet the evaluation of a medical professional. Did you know that employers are not required by law to provide access to health insurance? Some people believe that the law requires companies to provide health insurance. There is no such federal law. Most full time workers do have access to health insurance from their employer. Its considered a standard benefit in the US to get health insurance from your place of employment. However not all employers offer health insurance to their full time workers and few offer it to part time employees. The BLS tracks data on benefits for workers and they have a table with the stats for medical care benefits for workers. In private industry 71% of workers have access to health insurance from their employers. Only 51% of employees participate in an employers health insurance program. That means that among the workers with the health insurance option 73% of people take the insurance. There are various reasons why someone with the option of health insurance wouldn't sign up. For one they may have a spouse working at another job with better or cheaper insurance covering the family. Individuals may choose not to sign up for insurance because the cost is higher than they can or want to pay. Yahoo published the article Surprising Six-Figure Jobs that they got from CNBC. The jobs they list either don't usually make 6 figures or which I don't find surprising at all. This list is very similar to the list I wrote about before with You Probably Won't Get Paid $100,000 To DO That Its yet one more of the Stupid Job Lists that get published by the media. Call Center Analyst - What they are really talking about here is a management level kind of job. They are not talking about actual call center employees but the people who oversee call centers. It should be no surprise that people in management or supervisory level jobs can make over $100k. Afghan Language Specialist - Do you want to work in a war zone? I doubt you'll make high 6 figures as a translator from a nice cushy office chair in the USA. The high paying jobs I found for Afghan linguists are in Afghanistan. One DOE job includes danger pay. Yes you can make a fat salary if you have a specialized skill in high demand and you want to work in a war zone. I also wouldn't expect these to be long term or permanent jobs. Personal Trainer - Fitness instructors make average wages around $30k so that is not a high paying job. It is only the small minority at the top of the field who make over $100k. The people doing that well are self employed and have established their own clientele. This is not a typical income. Flight Training Coordinator - I couldn't find much about this job. Seems pretty specialized and not common. I would imagine to be a flight training coordinator you may need to be a licensed pilot with significant experience. If not then there are likely some other highly specialized skills needed. Nuclear Power Reactor Operator - Yes according to the BLS, the top 10% can make over $100k. I'm not surprised that the top people in this role make a very good wage. Furthermore very few people do these jobs and they are not likely to have many openings. Nationally there are only about 5,000 total people who work as nuclear power reactor operators according to BLS. To become a nuclear power reactor operator you may need multiple years of work experience in the reactor, you may need to get special licensing and pass special exams and you may need a college degree. Its a pretty specialized field with a handful of people that has a lot of requirements and even then only 10% hit the 6 figure level. Court Reporter - The average wage is closer to $50k. But they say: "those who are more experienced and can type 200+ words a minute make an average of $105,000" However BLS says the top 10% make $91k. Can you type 200+ words a minute? You probably can't. If you can type very fast then this kind of job may work out but its debatable if you'd make 6 figures. In the comments for the article someone says that the pass rate on the certification tests is 20%. Sounds about right. Very few people can actually type that fast to pass the exams required and then among them very few actually hit the 6 figure pay level. Elevator Mechanic - The average wage is about $70k. 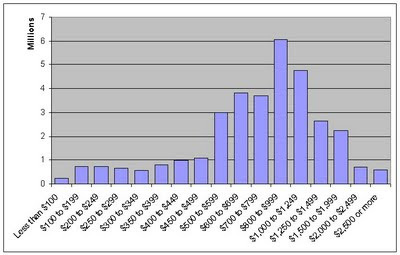 According to the BLS the top 10% of Elevator installers and repairers do make just over $100k. This is a good paying job for sure and you can hit 6 figures. You do have usually have to go through an apprenticeship program to get a job in this field but it doesn't require a 4 year college. However the job is physically demanding and can be a little dangerous like most construction field jobs. Pharmacists - I don't know why it would be a surprise at all that pharmacists can make 6 figures. Pharmacists require professional level education and its a highly skilled job. DoughRoller asks Should You Pay Off Your Mortgage Early? "Through the first quarter of 2011, nearly 600,000 college-educated white men ages 35 to 64 were unemployed, according to previously unpublished Labor Department stats. That’s more than 5 percent jobless—double the group’s pre-recession rate." I wondered if I was missing some major detail about how 5% unemployment was a tragedy. I wasn't. The entire story reads as if its written from an insulated position of people who are not really used to the reality of unemployment. 5% unemployment is something that most Americans would be thrilled to see but this article paints that 5% unemployment rate in the specific demographic as some sort of tragedy. When I say that they painted it as a tragedy I mean it. They used over the top language like "Detroit of the soul" and ""this hitherto privileged demo isn't just on its knees, it's flat on on its face." or "“if they lose their job, they are toast.” "The gnawing fear that this may be the beginning of a slow, shaming crawl to early Social Security." You get the idea. A few pages later they had a sub-story titled Love Means Never Having To Say ‘Get a Job’ That was a story written by the wife of one of the tragically afflicted upper middle class middle age white men with college degrees who had been subjected to actual unemployment. Few notable details in that story. The man had been a CEO at one company. He voluntarily quit his job at Google during the recession because his job had become "less exciting". Gasp! Then he cleaned his garage. Within 6 months he found another job but it was 2 hours away from home. I think the 2 hour thing was supposed to make us feel bad. Oh.. but it was his "dream job". Not only did this guy voluntarily quit his own job in the middle of the recession but he was able to find another in a relatively short 6 months. This is a success story if you ask me. Plus he had some time off to clean out the garage to boot! Seriously... he quit Google? Are we supposed to feel sorry for him or angry at him? I don't know. Reading the article I had a couple questions to myself: Why should I care that a group of college educated men are 'suffering' with 5% unemployment when the rest of he country is suffering with much higher unemployment? and Why would Newsweek even publish such a story? I don't know the answer to either of those questions. If I was a Newsweek subscriber I would consider canceling my subscription. I wasn't alone in questioning the article. Feministing wrote Maya and Lori on the “Beached White Male”: Newsweek spews steam out of its blowhole and FAIR wrote Newsweek Bravely Highlights the Plight of the Beached White Male. Both articles point out that unemployment in black workers is higher. Maybe it was all supposed to be a joke? The article was not dated April 1st. I had to check to make sure. My wife loves horses. One day it is her wish to own a horse (or two). However we live in the suburbs and don't have space to keep a horse plus horses can also be pretty expensive. Its still a long term goal for her to get a horse. The upfront cost of buying a horse is only a small part of the total costs. To know if we could really afford a horse at some point we'd need to know what the total long term costs would be. The cost of buying a horse is just the start. The bulk of the costs for a horse are in the ongoing expenses. There are a lot of ongoing costs related to the keeping of a horse. You will have to pay for :boarding / stabling, food, gear, routine vet bills, etc. I found a few references to what horses cost. Altogether I think if you're stabling a horse then you can expect to spend something around $400-$600 per month. Of course that is just a broad estimate number and the exact amount you spend will depend greatly on the situation. 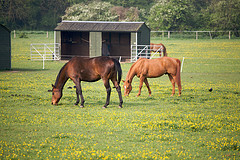 If you have your own acreage and stables then the cost will be a lot less. I'm sure that some people spend a lot more on their horses. If you're planning on buying a horse then you have to plan affording the monthly expenses. Horses can live 25-30 years so you need to cover the costs for a LONG time. If you assume $500 per month cost then that is $6,000 per year. If the horse lives 30 years then the total cost is $180,000 not accounting for inflation. Maybe you've got $6,000 extra to spend this year but will you have that money to spend in 5 or 25 years? One way to figure the total costs over a long period would be to calculate the Net Present Value. You can figure the NPV using the NPV formula in a spreadsheet. The NPV will give us an idea of the present cost of a series of cash flows over time. I assumed 5% interest and 3% inflation rate and came out with a Net Present Value of about $131,500. 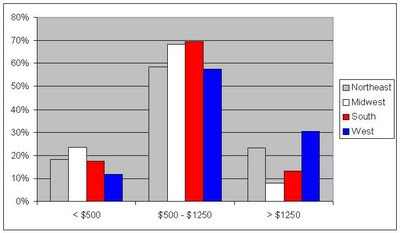 So if you started with a sum of $131,500 and made 5% on your money then this would give you enough to pay $500 monthly costs adjusted for inflation over a 30 year period. Therefore using this calculation we could say the long term cost of a horse in today's dollars is about $131,500. Again though I must point out that every situation is different. I'm assuming a $500 monthly cost and everyones individual costs will differ. We also don't know for sure how long the horse will live and I'm just using 30 years as a guess. How much people pay for rent depends on the nature of the housing and where it is located. You'll of course pay more to rent a 4 bedroom house in a nice suburban neighborhood than you'd pay for a cramped studio apartment in the ghetto. The cost of rent varies a lot across the nation. In the high cost urban areas rents are much more expensive than in the rural south. You can see that the bulk of the renters fall in the middle area. 64% of renters pay between $500 and $1,250. 17% of renters pay under $500. The remaining 19% of renters pay over $1,250. About 2 million people pay no cash rent. I'm not showing those in the chart. I assume those people are getting free rent from relatives or something along those lines. The biggest difference is between the Midwest and the West. 24% of people in the Midwest pay under $500 and 12% of people in the West pay that little. On the other end 30% of West renters pay over $1,250 and only 8% of the people in the Midwest pay that high. which I think is a good take on prioritizing our different levels of needs and wants. and Ask the Readers: What Is My Financial Obligation to My Family? If you've ever paid for COBRA or heard of a COBRA premium then you may know that the costs of coverage under COBRA can be very expensive. 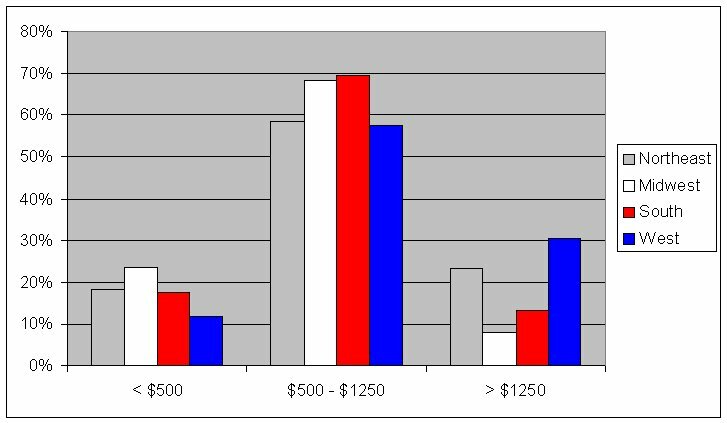 Its not at all unusual for monthly COBRA premiums to be $1000 to $1500. This is a very high cost. Why is COBRA so expensive? No, not that kind of Cobra. Let me quickly step back and explain that COBRA is a way that you can extend the health insurance you receive at your place of employment after you work. It is temporary in nature and can normally only be used 18 months. COBRA enrollment is available but optional. The Dept. of Labor's FAQ on COBRA explains that "Qualified beneficiaries must be offered coverage identical to that available to similarly situated beneficiaries" and "The premium cannot exceed 102 percent of the cost to the plan for similarly situated individuals who have not incurred a qualifying event, including both the portion paid by employees and any portion paid by the employer before the qualifying event, plus 2 percent for administrative costs" In other words COBRA coverage is identical to what you got when you were employed and the cost of COBRA is 102% of what the actual insurance costs. The cost of COBRA is no different than what the insurance costs for employed workers. Let me put it another way. Simply put : COBRA is expensive because the insurance policy is expensive. When you are working for a company the employees generally pay a portion of the cost of the health insurance and the employer pays the bulk of the insurance. That is how most employers have the health insurance benefits setup. According to Kaiser Foundation, in 2010 the average health insurance premium costs paid by workers for family coverage was $3,997 in 2010. However unknown to many employees their employer is still paying the large majority of the costs. Costs to employers averaged $9,773. The combined average cost of family coverage for health insurance premiums was $3,997 paid by the worker + $9,773 from the employer for $13,770 total. 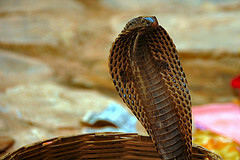 For this average policy cost the COBRA rate at 102% would be $14,045. As an average worker you may go from paying about $4,000 for your insurance to seeing a COBRA bill of $14,000. Thats a lot more than you paid so you could easily get sticker shock at the high cost. You may shop around and find an individual health insurance policy that is much cheaper. Individual policies may be cheaper than a group policy via an employer for many reasons. First of all group policies cover everyone regardless of existing conditions, age, or other factors. If you are young and healthy then you would be relatively cheap to insure so you may be able to get individual coverage for a fairly low price. Employers paying for group policies have to pay for all their employees which can include older people or people with existing illnesses. Another reason group policy offered by an employer could be more expensive is if it is simply better insurance. Often times you'll see cheap individual health insurance that cuts many cost corners. A cheap individual plan my offer lower prescription drug coverage, negligible out of network coverage, low limits on mental health, no maternity care, high out of pocket maximums, high co-insurance, etc. Unless you really do a close examination of what is offered you may think a policy is similar but be missing many ways it is not equivalent. Whether or not you should pay for COBRA is a different topic. While we're eon the topic of COBRA, I would like to point out that it is one of the things you can use Health Savings Account (HSA) to pay for. Thats another reason I really like HSAs. Bottom Line: COBRA is expensive because that is what the insurance costs. Group coverage may be more expensive than some individual plans. The Census Bureau data for 2 year average median household income by state. 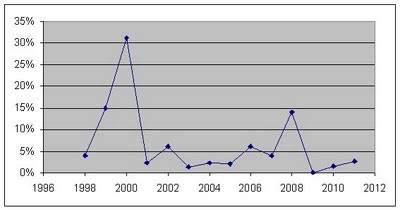 Below are the numbers for 2008- 2009. The 2-year-average median is the sum of two inflation-adjusted single-year medians divided by 2. The Simple Dollar is Announcing The Simple Dollar Personal Finance Seminar! In my first article on this series I covered weeks 1 and 2. I explained my couponing experiment which is briefly simply to cut the coupons out of the local paper and see how much I can save without putting in too much time or effort. Easter holiday fell in the 3rd and 4th weeks of my experiment. Easter weekend there wasn't much of any coupons in the Sunday paper. I assume people don't do much shopping so much on Easter so the merchants didn't bother doing the coupons. One weekend I forgot to bring the coupons with us on our shopping trip. The second week I clipped coupons on Sunday as usual but didn't get many good coupons. There was one 50¢ coupon for the deodorant brand that I use which is a safe bet for me. I did find some of the double coupons for Albertsons again. In the first two weeks I used these and saved a few extra bucks. However doing so required a separate trip since we don't normally shop at Albertsons. This time I couldn't resist and I went ahead and made another trip to Albertsons to see if I could quickly cash in on the double coupons. However I decided to just swing by there on my way home from work so that I didn't make a totally extra trip but instead just did a side stop. I had found some good $1 coupons on dog treats and was hoping that with the double coupons that I might get the treats for dirt cheap or even free. However the dog treats were normally priced in the $4 range so I decided against buying them. Saving almost 50% on the dog treats is a good deal but they aren't necessarily something we'd purchase. Buying something simply because its on sale isn't a good purchase. I could have used some of the 50¢ coupons and doubled those but I decided against that too since I didn't want to wait in line and spend much time shopping just to save an extra $1 or so. In summary the Albertsons trip was a bust and I didn't use their double coupons. On our next normal grocery shopping trip we did use the $2 coupon for dog food. I considered using a 75¢ coupon to buy a jar of pickles but the store brand was actually cheaper than the brand name even with the coupon savings. I've still got 50¢ coupons for tea and the deodorant. Those are definitely ones I'd use. Otherwise the coupons we have are things we might buy but may not. This really doesn't have much to do with personal finance. I just found it interesting. This slide at the Kaiser Foundation shows the number of doctors per 100,000 people over the past 40 years. The number of physicians per capita has done nothing but go up since 1970. In fact in the last 10 years alone the number went up 20%. The number of doctors per capita more than doubled from 1970 to 2008. In 1970 there were 146 doctors per 100,000 people and by 2008 it hit 322 per 100k. Doctors per capita figures vary a lot from state to state. In another Kaiser page you can see that the number of doctors per capita by state varies considerably. The staff levels in hospitals has been pretty flat really with some variation. Kaiser also has a slide showing the number of employees per admissions from 1980 to 2008. I'm happy to work for a company that gives pretty good amount of paid vacation time. Many Americans aren't so lucky to have good vacation benefits.. Most of Dad's vacation time was called "being unemployed". Compared to almost all other industrialized nations, Americans get and take very little vacation time off. We get no guaranteed vacation and the average amount of vacation given by employers is around 10-15 days. By comparison many of the European nations get 4 weeks paid vacation every year mandated by law. Canada and Japan are both similar to the USA in the amount of vacation time people get. They both average about 10 days vacation time. This CNN article from back in 2007 discussed a report by the consulting company Mercer that shows the amount of vacation and paid holiday time that people get in various nations. The USA ranks pretty close to bottom. Also the Mercer report gives the numbers that are 'typical' in America. There is a big fat asterisk by the US numbers and at the bottom of the table it explains the asterisk as: "These numbers reflect typical practice among large U.S. firms. There is no federal law requiring employers to give a minimum number of vacation days and holidays off, paid or unpaid." This ABC News article from last summer reported that "only 57 percent of people here are taking all of their vacation time" By comparison 89% of the French and 77% of the British use all their allotted time. This older article from Businessweek in 2007 says "more than half of American workers fail to take all their vacation days. Thirty percent say they use less than half their allotted time. " and "42% claim they have to cancel vacation plans "regularly." Now these reports don't specify if the vacation time is 'banked' or paid out in cash or simply forfeited. Some of the people not taking vacation may simply be saving it for later. Still going long periods without time off is not very good for your productivity. The amount of paid vacation time goes up with seniority as a general rule. The BLS table for the number of annual paid vacation days by service time breaks down the numbers. You might expect that government workers in the USA get big fat vacation time but they only average 1-3 days more than private employees. Extra 1-3 days is nothing to whine about but its not like they get 3 extra weeks or anything. BLS has a page on the Paid Vacation Benefits 2009 They give the percentage distribution of the number of paid vacation days based on years of experience. As you can see, in general the more experience you have on the job the more vacation you get. But there are variations there. A minority of people with 20 years experience get a week or less of vacation. On the other end some people with just 1 year on the job get as much as 4 or more weeks paid vacation. The data table for private employees on the BLS site breaks down paid vacation data further. Only 44% of the people making wages in the bottom 10% got paid vacation. Bottom Line: Relative to other industrialized nations we don't get much vacation time in America. On top of that Americans use their available vacation less as well. 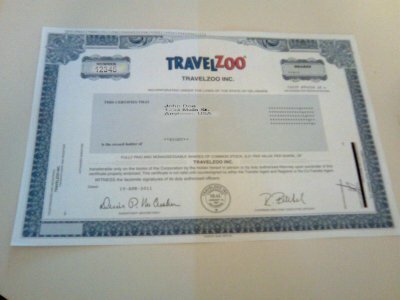 When I wrote about how I made $652 for free off of Travelzoo stock I mentioned briefly that I had to get a medallion signature guarantee stamp on my stock shares. The SEC has a page discussing the medallion guarantee. They explain that the stamps are used to protect the transfer of stock shares. The Medallion Signature Guarantee is a special stamp given to witness and guarantee the authenticity of a signature on the transfer of stock shares. "SEC Rule 17ad-15 requires that Transfer Agents adopt an equitable methodology for acceptance of signature guarantees from eligible Guarantor institutions. To comply with the SEC Rule, Transfer Agents approved three Medallion Signature Guarantee Programs, STAMP, SEMP, and MSP (Medallion Signature Program)." The stamp looks like the image below. Over 7000 banks and credit unions participate in the medallion signature guarantee program. That would include most of the banks in the country. The SEC site says that if you are not a customer of a participating financial institution then it is likely that they will not guarantee your signature. Therefore they say "the best source of a Medallion Guarantee would be a bank, savings and loan association, brokerage firm, or credit union with which you do business." The Wikipedia article on the topic adds to that : "Different institutions have different policies as to what type of identification they require to provide the guarantee and whether they charge a fee for such service (usually nominal if any.) Most institutions will not guarantee a signature of someone who has not already been their customer." The SEC also says that you can get guarantee signatures from "Stock Exchanges Medallion Program (SEMP) whose participants include the regional stock exchange member firms, and clearing and trust companies." or from "New York Stock Exchange Medallion Signature Program (MSP) whose participants include NYSE member firms. " So you may be able to get a guarantee via one of these firms. If your bank doesn't offer the service and other stock exchange firms are not available to you then you might try asking around other banks and credit unions. They may do the signature if you sign up for a free account or they might do it for non customers. When I got my TZOO stock shares guaranteed we went to our bank branch in our grocery store. We are customers of the bank we went to. We had to wait for the manager to actually do the stamp. The bank didn't happen to charge us a fee for the service. Bottom Line: Medallion signature guarantees are special stamps to certify a signature on a transfer of stock. Best place to try and get one is your local bank branch. Remember the wild west of the Internet tech boom? Remember how any company with .com in their name could IPO and make themselves instant gazillionaires even thought they hadn't made a single cent of revenue much less profit? OK maybe I'm exaggerating a little but it really did seem like the Internet boom was simply a crazed money grab with no sense of reality. It was in that era that Internet related companies gave away lots of free promotional deals in order to get their company some publicity and customers. Their promotions didn't really have to be cost effective as far as gaining actual business since the real goal was to get some buzz and increase the value of their IPO. Plus companies seemed to be banking on future gains since everyone seemed to assume 200% annual growth for anything Internet related. I set that stage to tell you the story of how I came to make $652.70 off of Travelzoo stock. Travelzoo is a company that sends out email newsletters about travel discounts and sales. When Travelzoo first started business back in 1998 they had an innovative marketing strategy. Travelzoo decided they would give you free shares of stock in their company as a promotional deal for signing up to get on their email list. This old CNN article discusses the free stock giveaway. Initially Travelzoo was private company and not publicly traded. So the value of the stock at the time was debatable at that time. Free stock? Sounded like a good deal to me. I signed up for the email and shared it with some friends. I ended up getting 8 shares of Travelzoo stock for free with little effort. Time went by and I pretty much forgot about my 8 shares of Travelzoo stock. I was still on their email list for a while and then eventually I must have canceled the email subscription. In the mean time Travelzoo went public in 2003 and has been traded as TZOO on the NASDAQ since then. It IPO'd at $6.50 a share. It had some ups and downs. 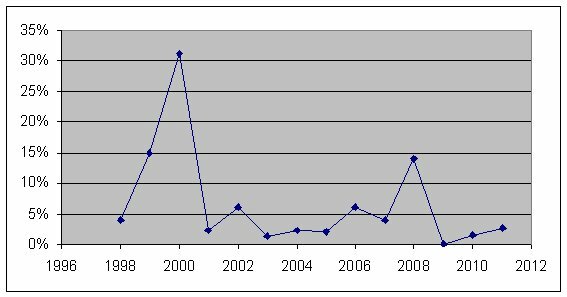 At one point in December 2005 the stock hit $110 a share. It spent the next few years trading between $15 and $40. In the midst of the recent recession the stock crashed down to under $4 at the start of 2009. Have you heard of Groupon? You probably have. You may also know that its business is growing like gangbusters and the company is worth a ton of money. Groupon is a Internet discount coupon kinda deal. Why am I talking about Groupon all the sudden? Well Travelzoo and Opentable are internet sign up kinda deals sort of vaguely like Groupon. This vague relationship between Groupon and companies like Travelzoo and Opentable have caused the stocks of Travelzoo and Opentable to go up a lot lately because they are riding the coattails of Groupon. At least that is my interpretation of what is going on. People want to cash in on the Groupon bonanza and are looking for other ways to take advantage of what they think might be a trend in that category of businesses. Because of this Groupon effect that is pumping up interest in Travelzoo the share values of Travelzoo have climbed considerably lately. I sat amazed recently watching the stock go up and up and up. First it hit $40.... then $60... $70... From October 2010 to April 2011 the stock tripled in value from $25 level to $75 range and it wasn't done yet. 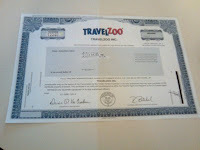 So now my 8 shares of Travelzoo are worth several hundred dollars. I decided it was time to cash out. The problem with selling the shares however was that they were not in a brokerage account. The shares were being held by Travelzoo themselves as custodian. I couldn't just hit a 'sell' button. In order to get those Travelzoo shares sold I had to do a few things. Another complication on the matter was that Travelzoo had spelled my name wrong. So first I had to fix that. To fix my name I had to print a form, have it notarized and then mail the form in. Then I had to sit and wait for them to fix my name. Thankfully that didn't take too long, I think they got it fixed within a couple weeks. For the next step I had to request that they send me a physical stock certificate so I could transfer the shares to my brokerage account at Scottrade. That meant filling out another form and this time I had to get it signed and then get it "medallion signature guaranteed". That medallion signature guarantee is similar to a notary but only done by banks and stock brokers. I found out that our local bank branch in our grocery store does that thankfully. So it wasn't too much of a task to get the medallion signature guarantee. We just stopped in at the bank while doing grocery shopping one Saturday afternoon. Then we mailed in that form and waited. I think it took another couple weeks till we finally got the shares in the mail. Last I had to go to the local Scottrade branch office and give them the certificate to deposit into my account. While this was happening recently Travelzoo issued their Q1 report and after that on April 21st the stock rocketed up over $20 in just one day. Crazy! Unfortunately my shares had not yet arrived in the mail or I would have sold them that day or the day after. My shares arrived around the weekend if I recall right. I was a little busy so I didn't get around to depositing them right away. In the meantime the stock was up even more and peaked over $103 on Monday April 25th. Finally on Thursday I found time to drop by a local Scottrade office and handed them the paper certificate. I signed the stock certificate on the back and they gave me a receipt. They said it would show up in my account Friday by around Noon sometime. By Noon time Friday the shares were in my account and I entered a sell order. I sold the 8 shares at $83.34 for a total of $659.70. The commission on Scottrade was $7 so my total profit was $652.70. All for free. I will of course have to pay long term capital gains taxes on the stock sale, but since I've owned the shares for over a year the tax rate is 15%. After taxes I'll be left with $554.79. All I had to do was : Sign up for an email subscription and share the link with some friends. Wait 13 years. Fill out a form and have it notarized and mail it in. Fill out another form and have it stamped with a signature medallion guarantee at the local bank office. Make a trip to my brokerage office to give them my stock certificate. And then finally issue a sell order to cash in my $652 of free money. Side note: The fact that Scottrade has convenient local offices is one very nice benefit of Scottrade that I like. They have a local office just a few miles from my house where I can quickly stop by during business hours to do stuff like this rather than having to deal with it all online or via mail.